Good Wednesday to all! How's everyone's week been going? Mine's been a little bit busy and the weather has been lame and rainy. We actually had our first thunderstorm yesterday, and boy did my afraid-of-everything Border Collie NOT handle it well. She's historically afraid of thunderstorms, but after the first clap yesterday she bolted into the dog cage (which is her sister's, not hers) and immediately popped a squat (after drinking a TON of water within the hour). I was on the couch and saw the whole thing so I got up and (gently) tried to tell her to stop, which made her feel so bad she immediately started trying to lick up the pee. I've never seen that, ever. So yeah, now the dog bed that is in the cage is on my patio airing out after cleaning it with some chemicals. YIKES. I'm considering getting a Thunder Jacket now. I've never considered it because I think it helps with pressure changes from a storm, which my dog reacts to as well. But she's so conditioned to be afraid all things loud noises, like fireworks, trucks backfiring, my electric guitar, etc that I wasn't sure it would help entirely. Now I just want anything that will curb her erratic behavior because it's getting worse with age! Does anyone have any experience with Thunder Jackets and their pets?!?! ANYWAY, the outfit! I had a lot more fun styling this outfit than I originally thought. 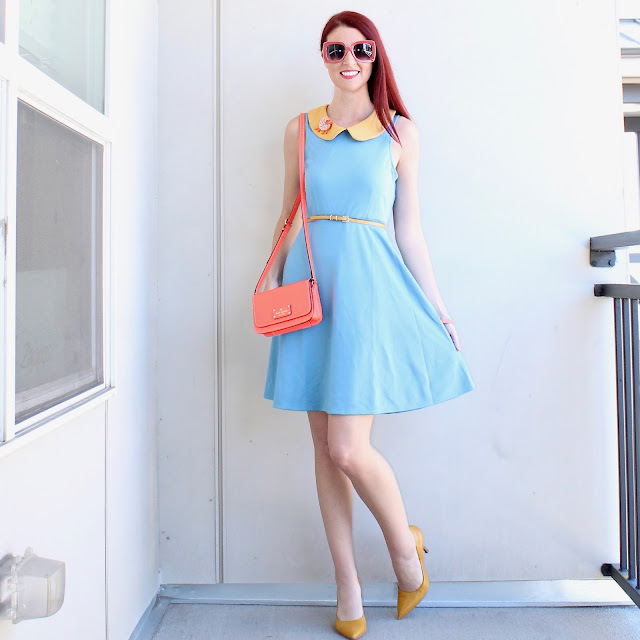 This Work to Play Dress from ModCloth is such a great homage to the 60s. I originally knew I'd immediately pair it with my mustard Nine West flax pumps (similar), but was kind of clueless past that. I saw my lizard brooch from Erstwilder while combing through my accessories and decided that that with my Kate Spade neon orange purse and eBay oversized sunglasses that it orange would be a fun color to play with on this dress. I've been in a much more simple mood style wise lately, so it was fun to play unexpected colors with each other like I used to! Aw your poor little doggy! Hope the jacket will help her.